Borg & Overström’s new 500ml refillable bottle eliminates the need for single-use plastic bottles. Over a period of just one year, each refillable bottle saves 80 disposable bottles from entering the environment. The harrowing scenes shown little over a year ago on BBC’s The Blue Planet, inspired many of us to examine our plastic use. We’ve since seen plastic-free towns spring up, a wave of support for a levy on single-use plastics, and a surge in the popularity of refillable water bottles. Over a third of us feel guilty when purchasing bottled water, and that figure is rapidly growing. 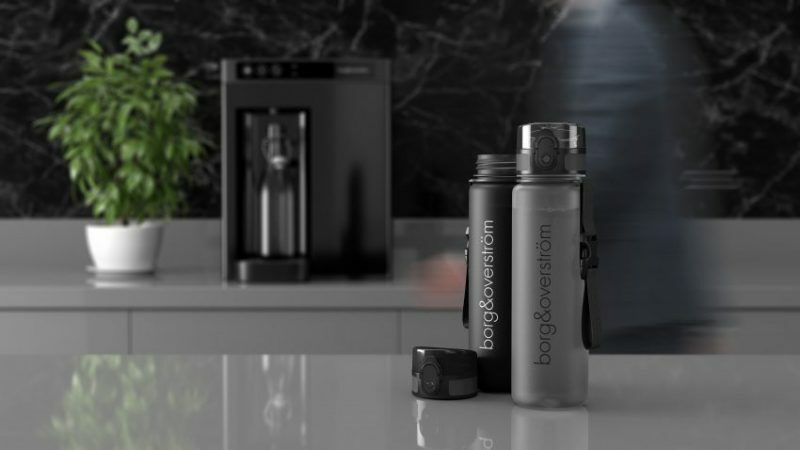 Borg & Overström’s personal drinking bottles answer this dilemma and enable individuals to take positive action. Each 500ml bottle is made from BPA-free Tritan™, is impact-resistant, lightweight and tough. They’re designed to deliver a perfect drinking experience for years to come, and their quick-release, leak-proof caps and free flowing drinking nozzles have been created to enhance and promote usability. This considered design also incorporates a measure gauge and carry strap for convenience. Borg & Overström has considered the environmental impact of all aspects of our new product and that’s why our bottles are supplied in boxes made of pulp wood derived from sustainable sources. Hygiene is also of maximum importance to us, and therefore we designed our bottles and their components to be easily washable in warm soapy water. Our bottles are ideal on the move for water, cold infusions or juices, and are available in black or grey frosted effect. And that is why Borg & Overström stands behind our personal drinking bottles. Each refillable bottle represents an opportunity to create a better world and to make water in disposable bottles a thing of the past. Our bottles do not respond to a fad, but to a demand for real solutions. Hygienic, practical and attractive, our bottles are built for longevity. None of us can escape the pressing need to take decisive action. But fortunately, the smallest changes can have the most profound effects. With heightened public awareness, a thirst for change, and good quality alternatives, we can all start to turn the tide on single-use plastic. Borg & Overström refillable drinks bottles are available through our trade distributors.